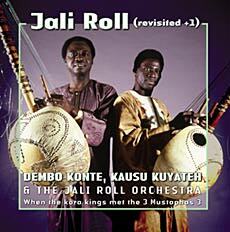 In late 1989, kora kings Dembo Konte & Kausu Kuyayeh got together with members of the nigh-legendary 3 Mustaphas 3, English folk/rock accordeon maestro John Kirkpatrick and others to produce the hardkorabilly classic Jali Roll. The album was not only a big hit on the African/ World Music scene at the time, its ripples have had significant and long-lasting effects on roots music making in West Africa. Now it's back on CD with an extra track from the only live gig by the band.